Schaefershelving.com |48"L x 45"W x 34"H Collapsible Bulk Containers 2 Doors | Bins & Containers -> Bulk Containers. 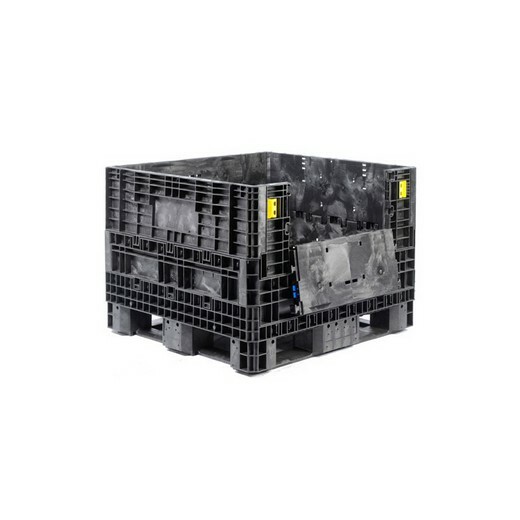 Containers for small parts, picking, shipping, and packaging systems. Plastic Bins, Straight Wall, Stack Nest, Collapsible, Conductive, Steel, Bulk, Plastic Pallets, Waste Carts. SSI Schaefer USA. Shop now! A 2,000 lbs load capacity, thanks to a patented design that prevents splitting of corner feet when loaded, most common failure mode of comparable boxes on the market. A base that achieves its rigidity with periphery runners only, eliminating the need for a center foot which can deflect downward and damage product in the container below. A flat deck that provides more usable internal cube. Smooth internal walls, very easy to clean and ideal for many applications such as automotive, textile and food industries and even wholesalers.